Ireland West Airport is unique in the Irish aviation industry in that it is operated as an independent airport by Connaught Airport Development Company (CADCO) Ltd, a private company responsible for its day-to- day operation. The shareholding of CADCO is a Partnership between the Horan Airport Trust and seven local authorities in the West and North West region who each have an 82.5% and 17.5% shareholding respectively of the company. 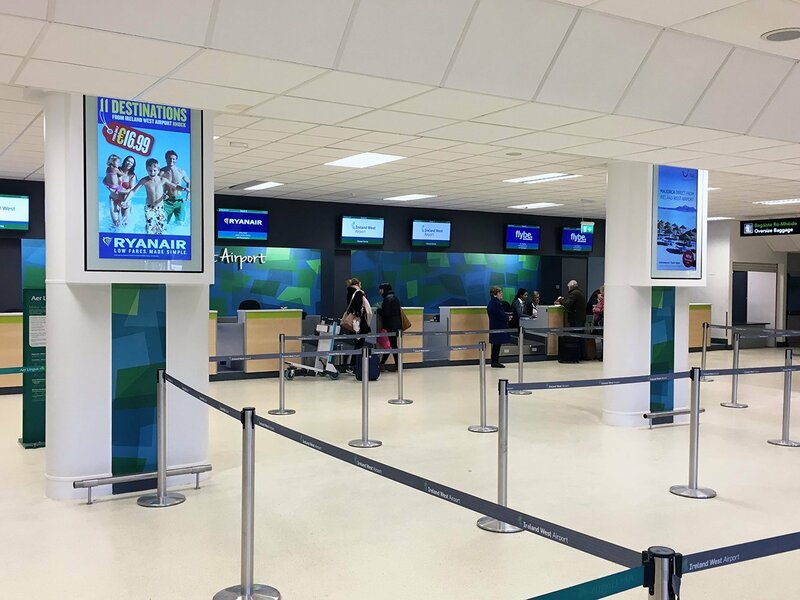 The responsibility of the trustees of the Horan Airport Trust is to ensure that any profits generated by the airport are re invested in the airport with a focus on providing support to the surrounding region. Through this structure, a level of community and regional-economy involvement is brought to bear on the airport’s focus not common elsewhere. The establishment of ‘Knock Airport’ (as it was known at the time) was the brain child of Monsignor James Horan in the 1980’s, at a time of widespread economic stagnation and mass emigration from the West of Ireland. Monsignor James Horan, Parish Priest of Knock, and a group of key supporters had the extraordinary vision to build an international airport, which to many seemed unrealistic and unattainable. The project was the subject of much public debate and media attention. The building of the airport is a remarkable story of one man’s and a region’s pursuit of a dream and the steadfast determination to keep going until the project was achieved. 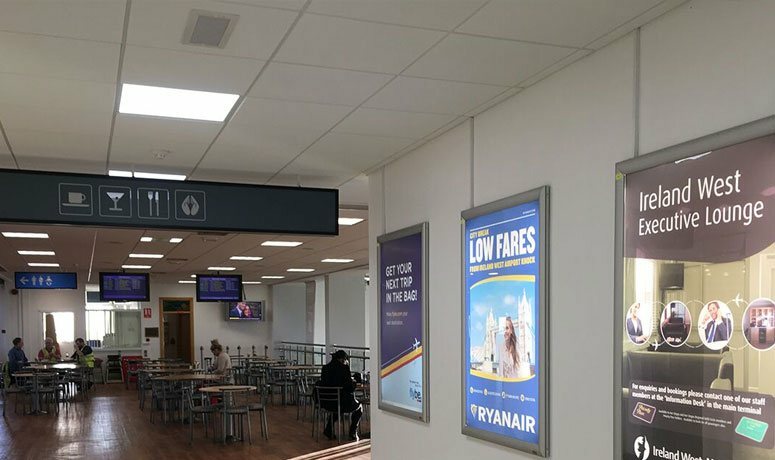 Ireland West Airport is the people’s airport as it is a monument to a communities determination to turn its fortune in time of economic hardship. Thirty years on from its official opening, 2016 seen the airport celebrate its 30th anniversary and fittingly had its busiest ever year with passenger numbers reaching 734,000 for the first time in the airport’s history. It was also a historic year as an investment by 7 local authorities for an equity shareholding into the airport was finalised which has seen the formation of a unique and positive collaboration with local government in the areas of tourism, economic development and diaspora engagement. As we look ahead to the future, while the economic situation presents many challenges both at home and in our key markets, the airport remains confident as a result of the strong business relationships the airport has with its airline customers. The positive regional support from the thousands of passengers that use the facility and the recent investment by the local authorities and continued support from Government that the future will mark further significant milestones in the airport’s growth and development. There are currently no job vacancies at Ireland West Airport. All new vacancies will be published here as they arise. James Horan was born on the 5th of May 1911 in the townland area of Tooreen, in the parish of Partry, Co. Mayo. He was the son of a small farmer and tradesman, and the eldest of 7 children - 4 girls and 3 boys. By the time he had finished primary school in Partry, he had begun to look to the priesthood as a vocation. For this reason, he entered for a scholarship to St. Jarlath's Dioscesan College in Tuam, Co. Galway, which he was successful in winning. In September 1929, he and 6 other fellow students from St. Jarlath's went to Maynooth College to train for the priesthood. He was ordained 7 years later, in 1936 with 71 other students. As there were no vacancies at home, he took up his first duty in Glasgow, in a parish called Dumbarton, August 1936. During his third and final year in Dumbarton, his parish priest asked him to act as chaplain on the Anchor Liner, 'California'. He was delighted to get the opportunity to go to America and meet all his friends and relations. When he returned to Dumbarton after the trip, he received a letter from the Archbishop of Tuam, Dr. Thomas Gilmartin, asking him to return to Ireland. At the end of August 1939, he returned and took up the position as Chaplain to the Franciscan monastery in Ballyglunin. After only 2 months there he was transferred to Tooreen in the parish of Aghamore as curate. One of the first things he noted about this area was the poor postal facilities, and without delay he was before post - office officials in Dublin's GPO seeking improvements. It could be said that he 'lit up' the parish of Aghamore, because it was he who was responsible for the introduction of electricity to the area. He also pioneered projects such as Group Water Schemes, Afforestation, and even Road Works and Drainage Schemes. He was probably best known at this time as Promoter of 'Tooreen Hall'. After 14 years he left Tooreen in July 1959 to go to his next parish, Cloonfad. Not long after arriving in Cloonfad, he was busy setting up an Afforestation committee. He also organised drainage schemes which were badly needed in the area due to its' low-lying boggy state. On Thursday September 12th 1963, Fr. Horan was transferred to Knock Parish as curate, and from 1967 as Parish Priest. He remained here until his untimely death on August 1st 1986. Often referred to as the 'Builder of Knock' he undertook to improve the facilities at Knock for pilgrims and parishioners alike. His main achievements during this time were. The invitation to Pope John Paul II and subsequent acceptance to visit Knock for the centenary celebrations in 1979. It took the vision and courage of Msgr. Horan to think on the scale, which the events of this visit dictated. It has been said that if one man brought the Pope to this country, it was James Horan. Over 450,000 people came to Knock on that day. His third and equally amazing achievement was the building of Horan International Airport. The fact that a Parish Priest in the west of Ireland could be responsible for a multi-million pound airport seemed unrealistic and unattainable. 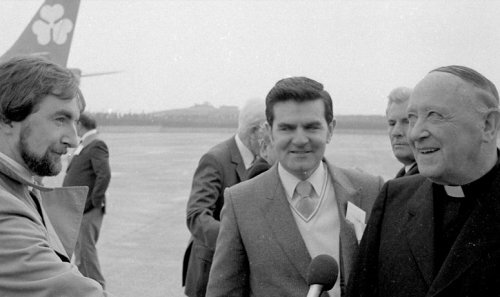 When the first flight out of Knock Airport, destined for Rome, departed on October 24th 1985, Msgr. Horan stated that it was 'the greatest day in the history of Connacht for a hundred years'. He showed his true character and sheer determination in achieving this impressive goal. Two months after the official opening of the airport, Msgr. Horan went on pilgrimage to Lourdes with members of his family and friends. He died unexpectedly on that pilgrimage on August 1st. His body was flown from Lourdes to Knock and was the first funeral to fly into Knock Airport. Msgr. Horan is buried in the grounds of the Basilica in Knock. May he rest in peace. 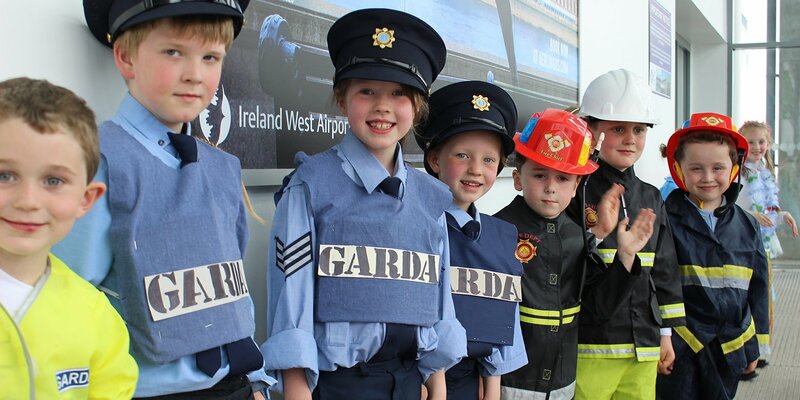 As the West of Irelands main international airport and a major employer in the region we take our responsibilities to the local community very seriously through operating with consideration and supporting worthwhile projects and initiatives in the local communities across our region. In a new initiative by the airport in 2016, airport staff voted to select 3 Irish charities for the inaugural Ireland West Airport Charity of The Year programme. The charities chosen were Cancer Care West, MS Ireland and Pieta House. Ireland West Airport staff were delighted in December to present a cheque for €30,550 to the three charities following a series of fundraisers throughout the year. The most successful fundraiser was the inaugural Bank of Ireland 5km Runway Run, which saw over 1,500 people take to the airports runway in glorious sunshine in late May – the first time in the airports 30 year history that the airports runway was open to the public for a charity run. Our 2017 charities of the year programme saw three Irish charities benefit from the fundraising efforts by airport staff and the airport were delighted to present a cheque for over €30,000 to Mayo Cancer Support, Western Care and Western Alzheimers. The airport works closely with local primary and secondary schools, colleges and universities to help raise awareness about airport careers and inspire our next generation. We regularly support educational visits to the airport to showcase the work that the various airport departments carry out on a daily basis, giving students a behind the scenes look at how a major international airport functions. This provides a valuable insight to help young people planning their own future careers. Work experience is an increasingly important part of a young persons preparation prior to leaving full time education. Ireland West Airport recognises the valuable role companies such as ourselves can play in providing work experience opportunities. Each year the airport provides a tailored work experience programme for students looking to gain hands on experience of working in an airport environment. Our HR department provides a comprehensive placement programme giving young students hands on experience working alongside staff in key departments at the airport such as air traffic control, ground handling, customer service and our retail and catering outlets and much more. There are 12 Digital 55 inch Totem Pods located throughout the airport terminal. Digital advertising offers endless possibilities for creativity and flexibility and allows advertisers to display dynamic and targeted campaigns. Advertisers benefit from digital advertising because it offers unparalleled creative flexibility. The digital sites allow advertisers to marry creative content with cutting-edge technology, delivering ground breaking campaigns that generate major buzz.